Peanuts have proved an ideal crop in Papua New Guinea, being easily grown in almost all areas of the country, most famously the great Markham Valley of Morobe Province. They are excellent nutritionally, being concentrated sources of both protein and fat, which of which tend to be low in the diets of many Papua New Guineans. The protein content of peanuts, in fact – is higher than that of eggs, dairy products, meat and fish. They are well liked by children and adults. Downstream processing of peanuts was the entire buzz in Papua New Guinea in the 1970s and 1980s. Peanuts were exported out of Lae to many countries in the South Pacific. In the Markham Valley of Morobe Province, peanut butter was mass-produced by the Atzera Rural Cooperative factory for both the domestic and international market. Sadly, those exports have ceased and the peanut butter factory has long closed its doors, and the humble but mighty peanut has now taken a backseat. However, they proved that downstream processing of peanuts was possible in Papua New Guinea, and do to this day. The challenge is upon us to make that a reality. Sum Sum, taken in its Morobe Province original meaning, is sunshine. Sum Sum, referring to peanuts, meant some of the best grown, processed and exported from Papua New Guinea. From an unimposing factory in Lae, the home of Nunga Tea and Coffee Company, came a fine variety of top-class peanuts, both salted and roasted, for the domestic and export market. Growers in the Markham Valley sold to the company either at the factory door or at the roadside. The factory boasted the biggest roaster machines in the country and the automatic packing machines made for an efficient and effective operation. The peanuts used in the salted variety were often hulled near where they were grown, and sorted at the factory, roasted, salted and automatically packed. About 40 workers were employed by the factory at its peak, with exports to many countries in the South Pacific region. In September 1976, a year after Papua New Guinea’s independence, the Atzera Rural Cooperative at Kaiapit, in the Morobe Province, embarked on its most ambitious programme yet – the manufacture of peanut butter. The cooperative built a factory at a cost of K40, 000 and started peanut butter production in September 1976. It was a unique operation in Papua New Guinea, as all peanut butter until then had been imported. 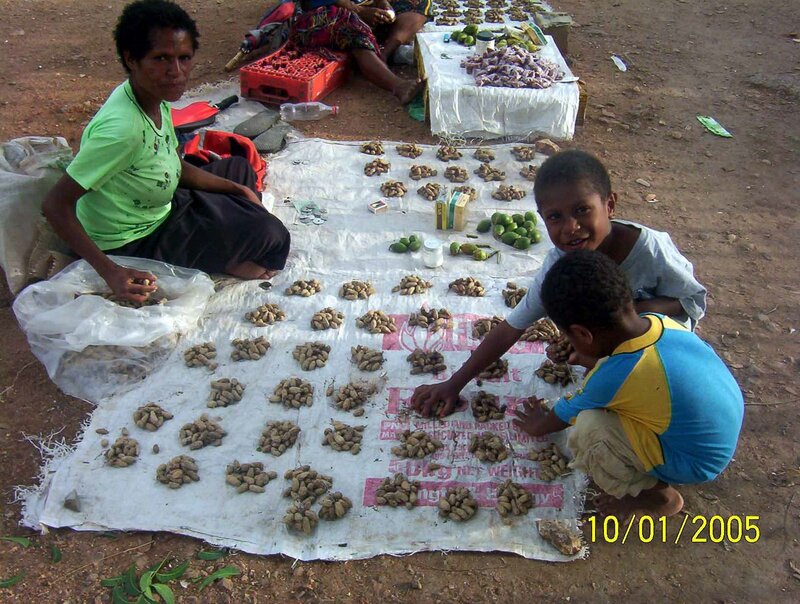 Atzera Rural Cooperative’s packaged nuts, Markham Peanuts, were sold in Kieta, Rabaul, Lae, Popondetta and throughout the Highlands. The 2000-odd members of the cooperative came from a wide area – from the Leron River to the Kassam Pass, in the Eastern Highlands. The factory grew, producing for both the local and export market, however, closed its doors in the early 1980s because of a variety of reasons. It, however, has made its mark in the history of downstream processing in Papua New Guinea. A recent study by the National Agriculture Research Institute (NARI) ranked peanuts as the No. 1 reliable income earner for many families. It was ranked among the country’s top five income generating crops, the others being kaukau (sweet potatoes), taro, banana, and Singapore taro. Peanuts, like betelnut, are a major income-earner for the people of the vast Markham Valley. The major customers are people from the Highlanders, who buy peanuts in bulk and in turn sell them at markets when they return home. This has been an ongoing trend for many years. Recently, peanut-growing has found new life. The community is becoming aware that under-nutrition continues to exist widely, and that peanuts are one of the best foods to overcome this. The major concern with peanuts is the risk of aflotoxin contamination, which is caused by a fungus when peanuts are not properly dried or when they become moist during storage. Almost all provinces have active programmes to improve nutrition, with peanuts having an important part in these programmes. The larger-scale Markham industry has also found new life. Remote Karimui in the Chimbu Province is known to produce arguably the highest quality peanuts in the country – better than the Markham – but the main problem has been transporting it to market as Karimui is only accessible by air. Lae-based NARI is trialing different varieties for the farmers of PNG. Trukai Industries is growing large tracts of peanuts in the Markham Valley. Ramu Sugar is going big time into peanut growing with a view to downstream processing in the not-too-distant future. The challenge now facing the industry is to generate improvements internally – to grow peanuts more productively, at less cost, and with greater production. This is clearly the case for the Markham Valley industry which, if it can keep costs down, can tap an enormous export market. This is also the case for the more important subsistence gardening of peanuts. People will grow more peanuts only if they get high production for the effort they put into the crop. To attain an increase in productivity will not be easy, particularly for subsistence growing, but it can be the only basis for a permanent improvement in the industry.